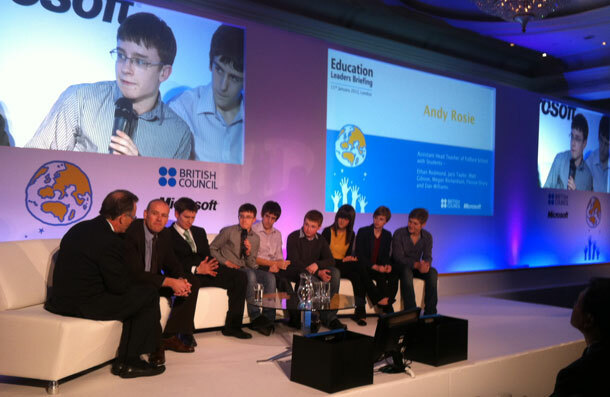 Merlin produced the Education Leaders Briefing event at The Mayfair Millennium Hotel which was part of the BETT education week and organised by Microsoft for The British Council. As part of creating the content for the event Merlin filmed students at York’s Fulford School participating in Project Based Learning with Microsoft products. The film was shown at the event followed by a discussion with the pupils. The event hosted education leaders from around the world, and included discussions and presentations on Anytime/Anywhere Learning and how Connected Learning could work in practice. Microsoft were looking for a more conversational style for the event, and less like a conference. We settled on a daytime TV style set with sofas, with the interviews relayed on two screens with extra content in the central screen.